Alien Nine (エイリアン9, Eirian Nain) is a Japanese manga series by Hitoshi Tomizawa, which was later adapted into an anime OVA series by J.C.Staff. The manga was serialized in Akita Shoten's Young Champion magazine, spanning 3 volumes. In 2003, Tomizawa released a 1-volume sequel to the series called Alien 9 Emulators. Both the manga and anime are noted for their moe art style contrasting the realistic art style seen in most seinen series at the time and heavy violence despite the young main characters, Pokémon-like monster designs, and initial appearances of a slice-of-life-esque series. The English adaptation of the series was first licensed by Central Park Media, and has played on Comcast's Anime Selects. 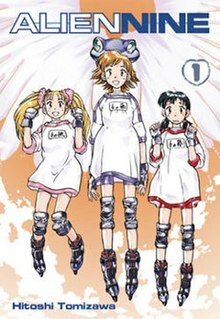 Central Park Media released the title under their "US Manga Corps" line, on a single DVD, and later re-released the DVD in a box set with all three manga volumes, which was also licensed by Central Park Media under their "CPM Manga" line. Central Park Media filed for bankruptcy in 2009, and the DVDs and manga volumes subsequently went out of print in North America. Yuri Otani, a rather melancholic 12-year-old, has just arrived in sixth grade and has (begrudgingly) joined the "Alien Party", a team whose primary objective is to capture any otherworldly aliens that may appear on campus. To make matters even worse for Yuri, the only way that capturing the aliens can be made possible is to adjoin with a "Borg", a symbiotic life-form whose sole purpose is to protect their host, incapacitate, and ultimately capture other aliens, using anything available to their arsenal (which includes, but is not limited to: Borgs, inline roller blades, knee pads, and lacrosse sticks.) Yuri is not alone in her tribulations, for she has two other Alien Party member friends - Kasumi Tōmine and Kumi Kawamura. A quiet girl, who was voted by her 6th-grade classmates to be their representative on the Alien Party. Yuri is very reluctant to merge with her Borg. She is easily frightened and there is hardly anything that won't make her cry, being scared or happy. The most independent member of the Alien Party, and a 6th-grade student. She has been a member of the Student Council for years and has assisted her widowed mother in her writing activities as well as an above average number of chores for a student her age. In the manga, she is attacked by an alien and is revived by fusing with an alien from the Drill "Clan". A "genius-type" sixth-grade student, who is talented in piano, ballet, chess, robotics competitions and roller skating. She is the most enthusiastic member of the Alien Party. Kasumi has a brother, whom she greatly loved and who was sent to a private school abroad. In the manga, after being absorbed by a Yellow Knife alien, she becomes part Yellow Knife herself, though hinted at in the anime. The teacher and counsellor in charge of the Alien Party. A sixth-grade student and Yuri's good friend and classmate. A symbiotic lifeform, whose sole purpose is to protect their host, incapacitate, and ultimately capture other aliens, using anything available to their arsenal. Borgs feed on the waste of their hosts. It would appear that when one is attached long enough to the Borg, they gain its abilities, as seen with some characters' hair despite the fact they aren't wearing one. "Operation 5: Alien Landing Today"
"Operation 6: A Chain Attack"
"Operation 10: Second Semester Begins"
"Operation 11: The Yellow Knife"
"Operation 15: The Kumi Incident"
"Operation 17: The Yuri Incident"
"Operation 18: The Forest of Spaceships"
"Operation 21: Third Semester Begins"
"Operation 22: You Can't Stop Me!" "Operation 23: Yuri the Fool"
"Operation 24: Try This Little Guy"
"Operation 25: Open the Window"
"Operation 28: The Alien Party"
"Operation 29: Who Am I?" "Operation 30: Back to Normal"
"Plan 1: A New World"
"Plan 3: Kasumi the Yellow Knife"
"Plan 4: Kumi and Yuri"
"Final Plan 5: Ultimate Symbiotes"
"Special Plan 1: Three Fit Girls"
"Special Plan 2: Maybe None of Us are Fools"
The first half of the series (through the middle of Volume 2) was later adapted into an anime OVA series, which was released across four volumes by Bandai Visual from 2001 to 2002, containing one episode each. Animated by J.C.Staff and produced by Genco, the first volume of the series was directed by Jirō Fujimoto, while volumes 2-4 were directed by Yasuhiro Irie, who also handled the entire series' character designs, and was written by Sadayuki Murai. A special TV broadcast was aired prior to the series' DVD release on AT-X. The opening themes are "Flower Psychedelic: Kasumi Tomine Version" by Noriko Shitaya, "Flower Psychedelic: Kumi Kawamura Version" by Kaori Shimizu, and "Flower Psychedelic: Yuri Otani Version" by Juri Ihata, the ending theme is "rebirth" by en avant. It has been broadcast by the anime television network Animax across its respective networks worldwide, including East Asia and its English-language networks in Southeast Asia (where it was previously also aired by its sister network AXN) and South Asia. The anime was licensed and released in North America by Central Park Media, with the series being aired across the region on Comcast's Select On Demand service. As the OVA series ends halfway through the story, the DVD was made available in America in an "Ultimate Edition", which included all three original volumes of the collected translated manga. Tarō Maki (President of Genco and executive producer of the anime OVA adaptation) has stated in an interview that due to the abruptness of the anime OVA ending, he stated that will raise funds to continue the series. However, this has not happened for over a decade and is considered to be in development hell and is most likely cancelled. That does not, however, rule out the possibility of a reboot to cover all three of the manga volumes plus the sequel, Alien Nine Emulators. Because of its rarity and cheap price, it has somewhat become a cult classic amongst fans and collectors alike. "Summer Vacation, Borg and Death"
"The End of the Beginning"
On Anime News Network, Zac Bertschy gave the story a grade of A and the art a grade of B+. Helen McCarthy in 500 Essential Anime Movies praises the OVA's pace and interesting character designs, stating that "although this looks at first like a cute, child-friendly sci-fi tale, it's actually a scare allegory on what it means to grow up". Divers, Allen (25 August 2003). "Procrastination is a State of Mind - TT". Anime News Network. ^ a b エイリアン9 (1) (ヤングチャンピオンコミックス) [Alien Nine (1)]. Amazon.co.jp (in Japanese). Retrieved 25 October 2015. ^ a b "Alien Nine: Book One". Amazon.com. Retrieved 25 October 2015. ^ a b エイリアン9 (2) (ヤングチャンピオンコミックス) [Alien Nine (2)]. Amazon.co.jp (in Japanese). Retrieved 25 October 2015. ^ a b "Alien Nine: Book Two". Amazon.com. Retrieved 25 October 2015. ^ a b エイリアン9 (3) (ヤングチャンピオンコミックス) [Alien Nine (3)]. Amazon.co.jp (in Japanese). Retrieved 25 October 2015. ^ a b "Alien Nine: Book Three". Amazon.com. Retrieved 25 October 2015. ^ a b エイリアン9 エミュレイターズ (チャンピオンREDコミックス) [Alien Nine Emulators]. Amazon.co.jp (in Japanese). Retrieved 25 October 2015. ^ a b "Alien Nine: Emulators". Amazon.com. Retrieved 25 October 2015. ^ エイリアン９　VOL.1 [Alien Nine vol. 1]. Bandai Visual (in Japanese). Retrieved 27 October 2015. ^ エイリアン９　VOL.2 [Alien Nine vol. 2]. Bandai Visual (in Japanese). Retrieved 27 October 2015. ^ エイリアン９　VOL.3 [Alien Nine vol. 3]. Bandai Visual (in Japanese). Retrieved 27 October 2015. ^ エイリアン９　VOL.4＜最終巻＞ [Alien Nine vol. 4 <last volume>]. Bandai Visual (in Japanese). Retrieved 27 October 2015. ^ Zac Bertschy (8 June 2003). "Alien 9". Anime News Network. Retrieved 2 August 2014. This page was last edited on 11 March 2019, at 22:27 (UTC).